Historically this is easy to understand. The Confederacy was primarily a vehicle for the interests of rich white slaveholders. It was also directly at odds with the interests of the Southern poor, whose wages were perpetually undercut by the persistence of free labor, and whose lives were disproportionately sacrificed in its defense. To win their support, the rich worked to cultivate a culture of racism rooted in last-place avoidance and investment in the status quo; but this appeal had limited traction outside of the middle class, for obvious reasons. Direct memory of this class conflict certainly survives among the Southern poor, who were raised to remember the Civil War as "the rich man's battle and the poor man's fight"; but its legacy also persists in the politics of Neoconfederacy, which remain grounded in opposition to the federal government as an agent of redistribution. Even if they happen to harbor racist attitudes, the poor still have little stake in opposing federal economic intervention, and significant reason to support it. 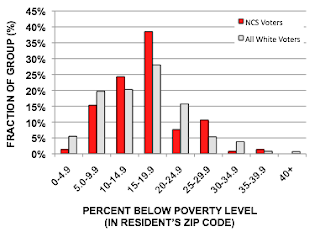 Perversely, the Liberal stereotype of "poor white trash" can itself only be understood as a form of classism - it is ignorance of the plight of the southern poor rooted firmly in privilege. Liberals, sheltered in the relatively prosperous urban north, had little need to acquaint themselves with the history and views of the southern poor. And as David Williams writes, it seems "to gratify the pride of many northerners to think their ancestors defeated a united South," a kind of "regional vanity" that leads them to "generally demonize white southerners." Today, as capitalism immiserates North and South alike, vilification of poor southerners functions as yet another expression of last-place avoidance. What Liberals and Neoconfederates both have in common: enduring bigotry cultivated in the service of class. Yesterday, Glenn Beck led thousands of protesters in a march through Birmingham, Alabama. Multiple speakers invoked Martin Luther King Jr., and organizers distributed signs of Frederick Douglass for participants to carry. People of color (POC) sang in a choir at a rally the night before, and POC were positioned prominently in most publicity photos. Most people who aren't already in league with Beck will instantly recognize this as a shameless attempt to co-opt Americans of color and their extraordinary activism over the past few years. Glenn Beck's agenda obviously does not have significant support among them; it largely opposes their interests, in this case quite directly. And Beck's Restoring Unity rally bears all of the familiar signs of an astroturf operation: aggressive promotion, a savvy media strategy, carefully stage-managed optics, centralized control, and so on. Most people on the left get this; and one would hope that their skepticism would translate into a broader concern about attempts by the powerful to co-opt the activism of POC. That's why it's so puzzling that so many have so conclusively ruled out the very possibility of liberal interests trying the same thing; there is, in fact, every reason to believe that it's already happening. Obviously, @DougHenwood. But #BlackLivesMatter argues income redistribution alone isn't going to solve police brutality. And I agree. Set aside whether or not Smith's critique of left politics happens to be correct. Is it not enough to point out that there are clearly people involved in the movement who disagree with him? And that most will never even have the opportunity to challenge him on this, or on anything - certainly not on equal terms? What is "Black Lives Matter," in Smith's mouth, but a way for a powerful man who controls massive media platforms to substitute his opinions for some of the most powerless and silenced people in America? Liberals will be tempted to consider this situation through the lens of what Matt Bruenig calls Identitarian Deference (ID), and conclude that we should defer to Smith on this since he is himself a POC. This is pretty dicey even if we take his claim at face value, since deferring to Smith here necessarily means rejecting the perspective of another POC (the one he is at odds with) - a move ID categorically forbids. That kind of internal contradiction's a significant problem for ID, but I see another that's even more compelling: to the extent that we recognize that POC are oppressed, silenced and excluded from the controlling mechanisms of public discourse, we have to recognize that they are therefore necessarily vulnerable to co-option. The people who speak for them most visibly and who do the most to define their public identity will always be people whose lives are significantly different from theirs: they will be media figures, politicians, and members of the activist elite, all groups still dominated by the interests of racism and white supremacy. In particular, it's worth bearing in mind that the POC most victimized by police violence are the poor. From this it follows trivially that a truly representative movement would be overwhelmingly spoken for and constituted by the poor - even if middle-class and wealthy POC also participate. These are largely people who are not involved in college activism, since they are not in college; who do not have large media platforms or significant media connections; who do not have the financial support necessary for full-time activism; and who have relatively little training and experience with organizing high-profile political and media campaigns. They are far more likely to be the people we see in news footage marching in the streets or getting arrested by riot police; they are relatively unlikely to be talking heads on cable news or Twitter celebrities with blue checks by their names. Bearing this in mind, activism by Americans of color in recent years takes on a somewhat different character than its representation in the media. First, it appears to be almost exclusively concerned with the specific problems of racist police brutality and prosecution. Groups identified with BLM have certainly addressed a whole range of worthy issues, from LGBT rights to disproportionate incarceration rates; but by far, the largest, most powerful actions with the greatest claim to participation and representation are the ones that have followed the murder of POC by police and subsequent refusals to prosecute. These are the incidents that have compelled huge numbers of POC to take to the streets, and these are the protests that they've been willing to push to the point of crisis, often taking absolutely heroic risks and sacrificing their own safety and freedom in the process. Second, the largest protests have typically been relatively autonomous and spontaneous. In Ferguson, for example, it's clear that the riots emerged organically from an initial candlelight vigil; that they snowballed from there as local residents and a wide range of local organizations got involved; and that the national, "original" BLM organization only got involved after the fact. Notably, many of the initial protests were so distinctly independent that multiple (largely white) media figures were scandalized to discover that radical leftists across the country had joined in solidarity. It's telling that many of these same critics abandoned their suspicion of co-option when different outsiders got involved, and now rarely challenge the elites who claim to speak for BLM on a regular basis. And third, while the actual movement has enjoyed significant participation among POC - and while its actual actions are significantly aligned with the concerns of most POC - we cannot forget that an extraordinary number of POC remain completely alienated and disengaged from the movement. There are all kinds of reasons for this, ranging from the incidental (some people don't live near any of the flashpoints) to the intrinsic (some are afraid to participate, some can't afford to, some are incarcerated, and some have simply despaired). There are still ways that we can deduce their interests - through polls, for example, or through various modes of socioeconomic and political analysis - but we must in any case acknowledge that many of the people we should care about the most are precisely the people who remain voiceless. When we consider these three points, I think there's reason to regard #BLM - not the movement, but the brand - with some minimal degree of vigilance and skepticism. To my mind, one of the most important refrains to emerge from all of this is the expectation that white people should listen to what POC are actually saying; this is a worthy point whether one buys into the politics of ID or not. But listening to POC doesn't mean just listening to people who claim to speak on their behalf. It means listening to the people themselves - all of them. Anyway, Žižek's comments on the topic are scattered all over the place - books, articles, videos, etc. - so I thought it'd be useful to post two of the most compelling excerpts here. ADDENDUM: Ryan Cooper is thinking basically the same thing. If the practical effect of your vision of any right leaves you always supporting it only for those you agree with, that vision is broken. It's unclear to me why someone interested in maximizing freedom would necessarily reject socialist censorship. Consider private property, for instance. It's absolutely antithetical to freedom. It's nothing more than violence against anyone who dares to exercise their freedom contrary to despotic claims on the commonwealth. This is easily the most ubiquitous and enduring form of tyranny in the modern world - it's such a constant assault on our liberty that we barely even notice it anymore. And it's even rarer still that we actually exercise the freedom it prohibits. Capitalism's looming threat of violent retaliation has traumatized almost everyone into a state of learned helplessness. Certainly a society without private property is freer than one with private property. But what about a society free from private property - because the advocacy of private property has been banned? This is obviously less free than a society where private property has disappeared spontaneously. But is it also less free than a society where the tyranny of private property remains? Possibly - but that's a point to be argued for, not just assumed. It seems to me that a ban on private property advocacy would impact our day-to-day lives far less than private property does. The historical record makes this pretty clear. The censorship of bourgeois propaganda in the Soviet Union, for example, was indisputably tragic, as vividly demonstrated by well-known contemporary accounts (and body counts). The violent enforcement of private property rights, meanwhile, has been demonstrably worse. This isn't a subjective judgment: by every metric you can imagine, private property rights are the proximate cause of more death, more suffering, and greater oppression than Soviet censorship ever was. If we're concerned about freedom, the comparison is no contest. Capitalists, of course, would reject that assessment - but the numbers here are only incidental to my point. If socialist censorship is worse than the alternative, it is worse because it has a worse impact on our freedom than capitalism. It's not enough to simply notice that censorship inhibits our freedom; of course it does. But is that worse than a world with private property? It's always worth bearing in mind, as Isquith argues in a new piece for Salon, that even political villains have complex motivations. As far as it goes, this is a useful corrective against the tendency to caricature the rich and reactionary as monsters who simply want to destroy the world. Presumably there are Sanders followers who think about politics in this way, since it's how most people probably think about politics, and certainly this sort of simplistic politics can keep us from developing a more sophisticated and accurate understanding of the world. That said, since we clearly find the most sophisticated and accurate politics in comic book movies, we would do well to remember that some men just want to watch the world burn. This is not great as a sole basis for political analysis, but in the end we have to account for it. Sociopathy is a clinical fact. A good four percent of the population have brains that work differently from everyone else's, for reasons that are increasingly well-understood. They are not immoral, but amoral. They are absolutely-self interested, and can enjoy hurting others. And they experience neither guilt nor shame. Moreover, sociopaths are significantly over-represented among the rich and powerful. They are typically ambitious, obsessive, competitive, and enjoy risky behavior - all features that capitalism often rewards. In fact, some firms actually deliberately recruit sociopaths. Since sociopaths are not merely a possibility but a relative probability among the ruling class, we're faced with precisely the problem that Isquith's article tries to dismiss: how do we defend democracy against people who are greedy and powerful? It is entirely possible for the mentally ill to accumulate power and influence and to try to use both to manipulate the public towards destructive and entirely selfish ends. This may not be the central challenge facing the left, since capitalism is more of a systemic and structural problem than one governed by individual personalities - but it it nevertheless a challenge, and one that we should definitely take seriously. Isquith is right on another point: if the Kochs disappeared tomorrow, "some other coalition of plutocrats from above and reactionaries from below would step in." But does it follow that their successors would be just as fanatical, just as ruthless, and just as aggressive as the Kochs? Four percent is a small number. Even as America is afflicted by capitalism, we may also be afflicted with some serious bad luck: the unlikely consolidation of power in the hands of the literally insane. We can't rule it out! The Dow's continuing plummet has clearly caught our economists off guard, but no one should find any of this surprising. Eggheads in the ivory tower like to pretend that the American economy is driven by all kinds of complex and somewhat unknowable factors, but at the end of the day, the market is only as good as the workers who make it. Got unemployment? It's because lazy people are hooked on welfare. Productivity problems? Someone's obviously slacking off and taking shortcuts. The wealthiest Americans, of course, are showing even more hustle than last year, giving it 118% in 2015; and the poorest Americans, of course, can't slack any more than they were already slacking. But we see a significant drop-off in hustle among the middle three groups, with an astonishing 18% plummet among the second quintile. I haven't bothered to look into this but can only assume we'd see a similar story during most dips and recessions. The laws of capitalism are immutable, and when the economy has problems it's usually pretty obvious who's to blame.